A Santa Barbara birder saw a hawk perched on a wire in Carpinteria, California, November 25, 2012 and photographed it. He didn't recognize it as one of the local resident hawks and consulted with others as to the identity of this hawk, and it turned out that it was a juvenile Gray Hawk in its 2nd or 3rd year. This bird was a true vagrant and the 1st documented California record. The nearest area where this bird can be found in any numbers is Southern Arizona, Truly, this hawk was a long ways from home. It remained at this location into 2013 and then disappeared just before spring. Speculation was, would it return in the coming winter, and low and behold it did, and spent the winter of 2013 and 2014. Again it disappeared and everyone wondered. It again showed up in December, and is on course to spend the winter of 2014 and 2015. Not only did it return for the 3rd winter, it's in the same exact area where it was first found and photographed. Gray Hawk - 1st Record For California from Don DesJardin on Vimeo. It is mostly black and white, with a large yellow wing patch and yellow sides on the tail. It has a small white ear patch, a thin white whisker at the base of the bill and a white eye. This honeyeater is an active bird, and rarely sits still long enough to give an extended view. Females are slightly smaller in size. Young birds are browner and have a grey eye. It's range extends throughout southern Australia, from about Brisbane, Queensland, to just north of Perth, Western Australia. 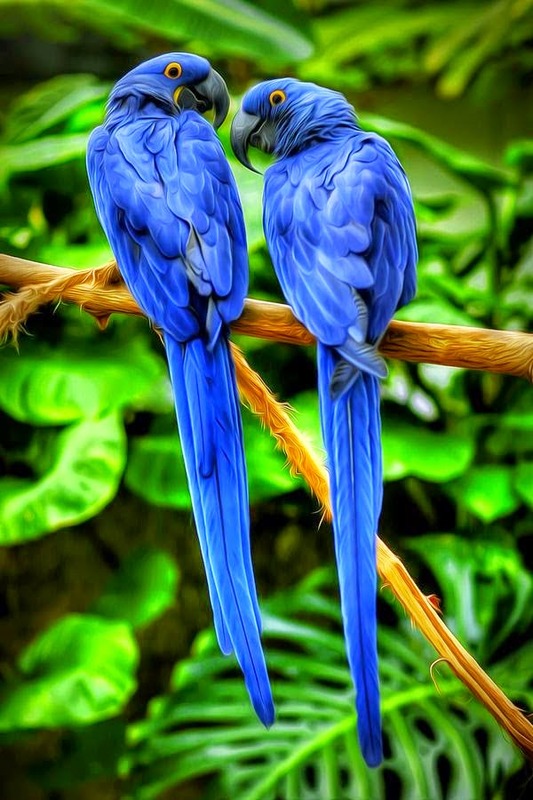 The hyacinth macaw, or hyacinthine macaw, is a parrot native to central and eastern South America. With a length of about 100 cm it is longer than any other species of parrot. It is the largest macaw and the largest flying parrot species, though the flightless kakapo of New Zealand can outweigh it at up to 3.5 kg. While generally easily recognized, it can be confused with the far rarer and smaller Lear's macaw. Habitat loss and trapping wild birds for the pet trade has taken a heavy toll on their population in the wild, and as a result the species is classified as endangered on the International Union for Conservation of Nature's Red List, and it is protected by its listing on Appendix I of the Convention on International Trade in Endangered Species of Wild Fauna and Flora. Rofous Crested Coquette ,is a species of #hummingbird in the trochilidae family.It is found in Bolivia,Columbia,Ecuador,Panama and Peru.Its natural habitats are subtropical or tropical moist lowland and forest subtropical or tropical moist montane forests and heavily degraded former forest. 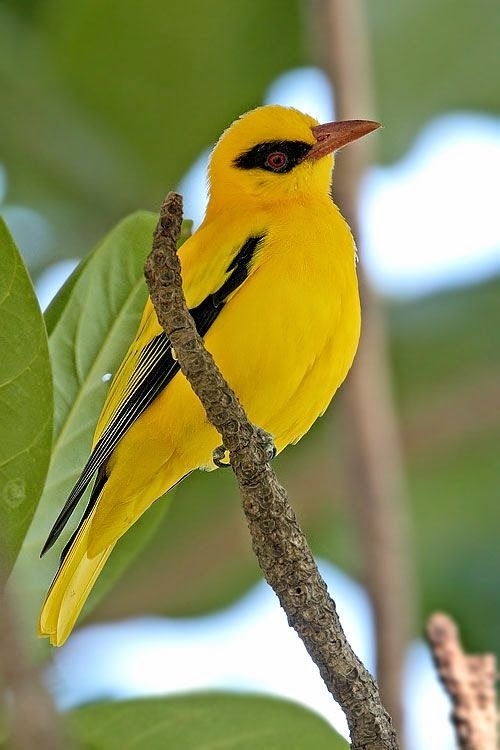 The African Golden Oriole (Oriolus auratus) is a member of the oriole family of passerine birds which is a resident breeder in Africa south of the Sahara. 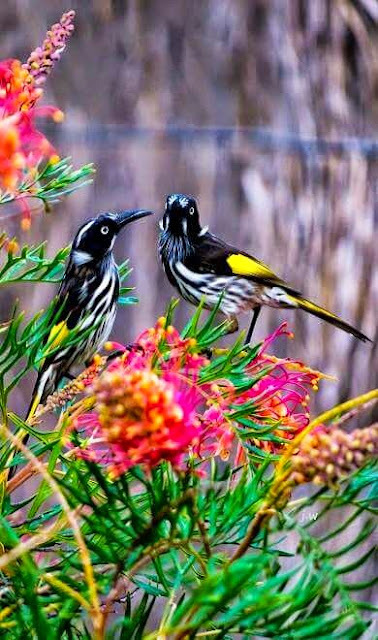 It is a bird of thick bush and other well-wooded areas. 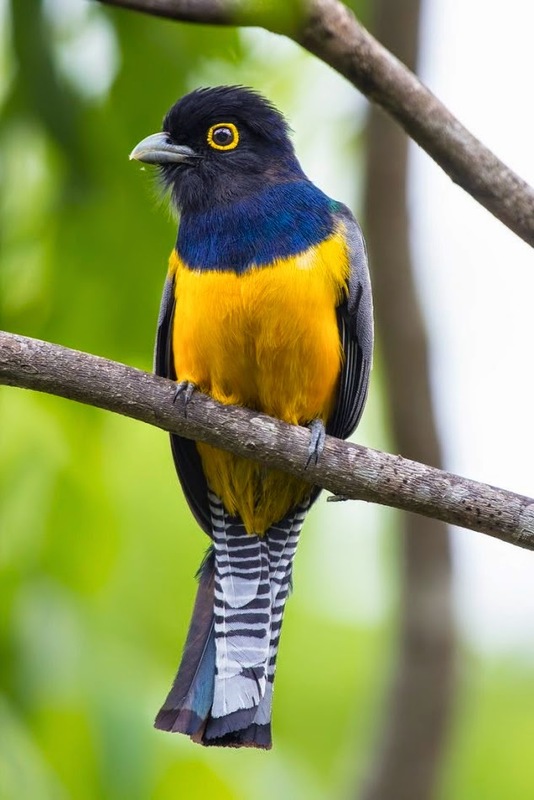 The Gartered Trogon also known as the Northern Violaceous trogon is a near passerine #bird in the #trogon family ,trogodinae .It is found in forests in East Central Mexico ,south through central America ,to north-western South America ,west or north of the Andes in Columbia ,Ecuador and Venezuela. 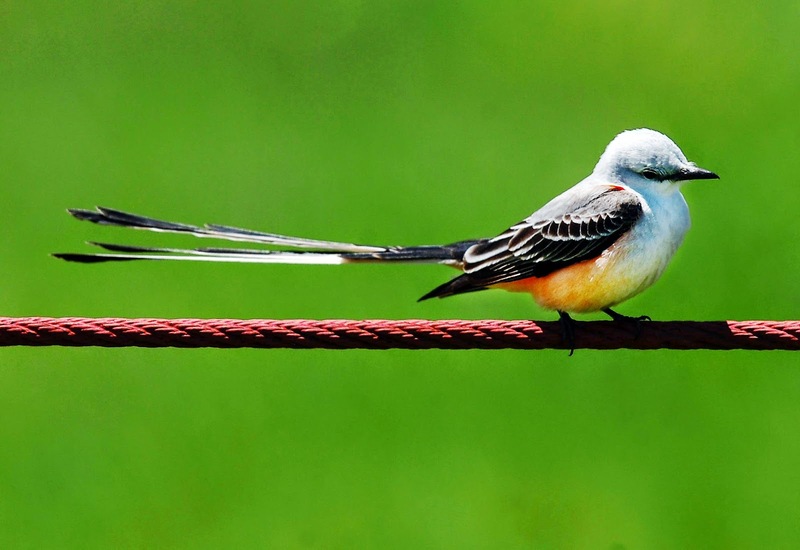 The Striking Scissor-Tailed Flycatcher is Only Regular “Long-Tailed Kingbird”. 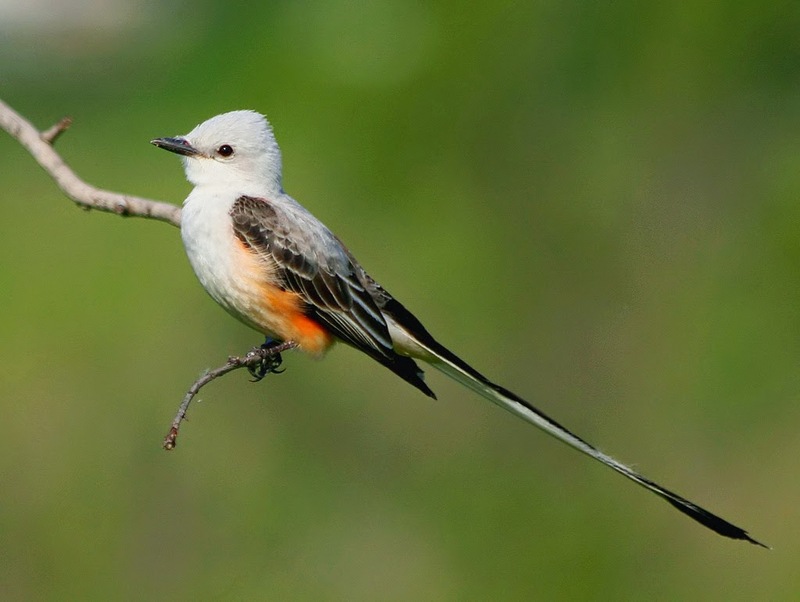 The striking scissor-tailed flycatcher is our only regular “long-tailed kingbird.” But it is not only elegant and attractive, but also common and easy to observe. 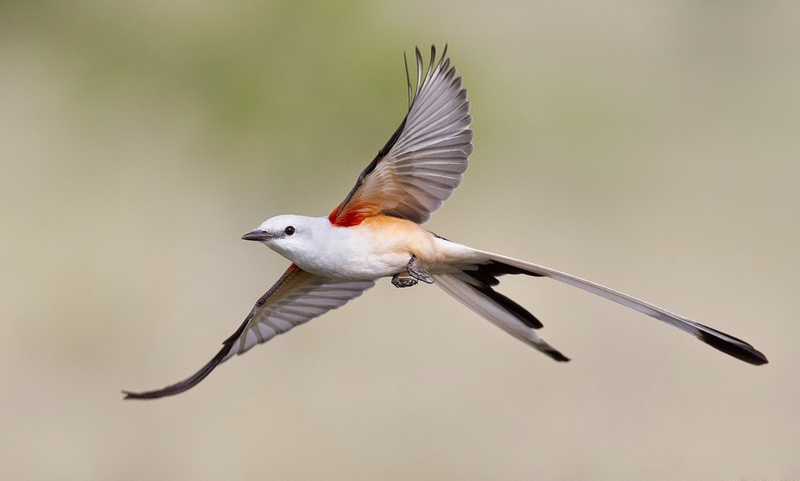 The splendid scissor-tailed flycatcher (Tyrannus forficatus), also recognized as the Texas bird-of-paradise and swallow-tailed flycatcher, is a long-tailed bird of the genus Tyrannus, whose members are collectively referred to as kingbirds. Well, the kingbirds are a group of large insectivorous (means insect-eating) birds in the tyrant flycatcher (Tyrannidae) family. The scissor-tailed flycatcher can be found in North and Central America. This bird was also famous with its former Latin name “Muscivora forficate”. The former genus word, “Muscivora” actually derives from the Latin word for "fly" (musca) and "to devour" (vorare), while the species name forficata derives from the Latin word for "scissors" (forfex). The long scissortail bird is now considered to be a member of the Tyrannus, or "tyrant-like" genus. This genus earned its name because quite a few of its species are exceptionally aggressive on their breeding territories, where they will feel no hesitation to attack on larger birds such as crows, hawks and owls. Moreover, adult birds have pale gray heads and their upper parts, light underparts, salmon-pink flanks and under tail coverts, and dark gray wings. Axillars and patch on underwing coverts are red. The bird’s species extremely long, forked tails, which are usually black on top and white on the underside, are characteristic and unique. At maturity, the male may be up to 15 inches in length, though the female's tail is up to 30 percent shorter. The wingspan is 15 cm and the weight is up to 43 g. Further, Lmmature birds are duller in color and have shorter tails, whereas a lot of these birds have been reported to be more than 40 cm. The male and female travel together throughout their territory in search of a nest place in open prairie, mesquite prairie, parks, gardens, pastures, croplands, roadsides or saltmarsh edges. When they discover a potential nest site in an isolated tree or shrub, they both hop around and test out diverse spots by pressing themselves against the branches. They normally select an open site that’s sheltered from the prevailing wind and often shaded by some foliage. These birds build a cup nest in isolated trees or shrubs, sometimes using artificial sites such as telephone poles near towns. The male bird performs a huge aerial display during courtship with his long tail forks streaming out behind him. Both species feed the young bird and like other kingbirds, they’re extremely aggressive in defending their nest. Normally these birds’ clutches contain 3 to 6 eggs. 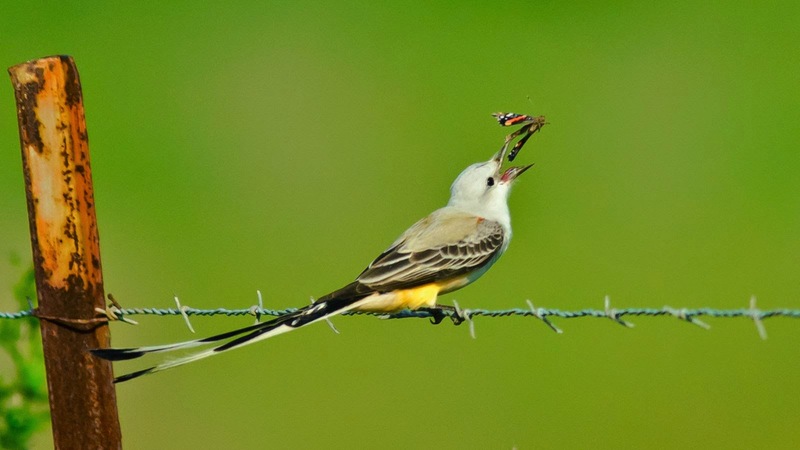 In the summer season, scissor-tailed flycatchers feed mostly on insects i.e., grasshoppers, robber-flies, and dragonflies, which they may catch by waiting on a perch and then flying out to catch them in flight. If they need extra food in the winter season, they’ll also eat some berries. The bird breeding habitat normally in open shrubby country with scattered trees in the south-central states of Texas, Oklahoma, Kansas; western portions of Louisiana, Arkansas, and Missouri; far eastern New Mexico; and northeastern Mexico. It is reported sightings record occasional stray visitors as far north as southern Canada and as far east as Florida and Georgia. The birds migrate through Texas and eastern Mexico to their winter non-breeding range, from southern Mexico to Panama. Moreover, pre-migratory roosts and flocks flying south may comprise as many as 1000 birds. The lovely scissor-tailed flycatcher is the state bird of Oklahoma, and is displayed in flight with tail feathers spread on the reverse of the Oklahoma Commemorative Quarter. 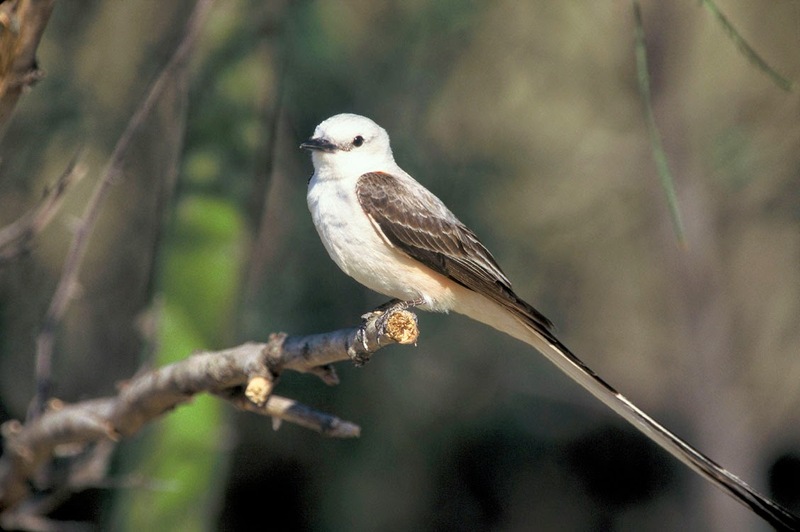 The Scissor-Tailed Flycatchers have the habits of having several human products in its nest, such as string, cloth, paper, carpet fuzz, and cigarette filters. Well, this beautiful Scissor-tailed Flycatcher numbers are a small decline between 1966 and 2010, however, according to the North American Breeding Bird Survey. A decline was noted in the mid-1970s, which was offset by an increase in numbers during the 1980s. Moreover partners in Flight estimates a global breeding population of 9.5 million with 92 % breeding in the United States., and 50 % spending some part of the year in Mexico. 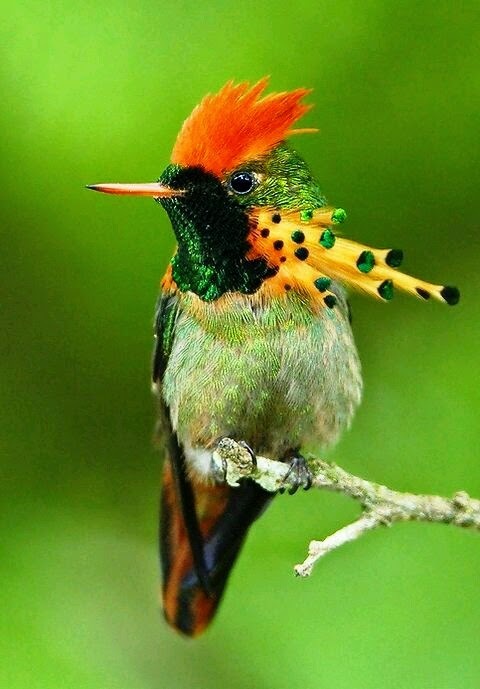 Tufted coquette is a very small hummingbird, more similar to an insect than to a bird. It is widely acknowledged as Trinidad's smallest resident bird at 2.75 inches. 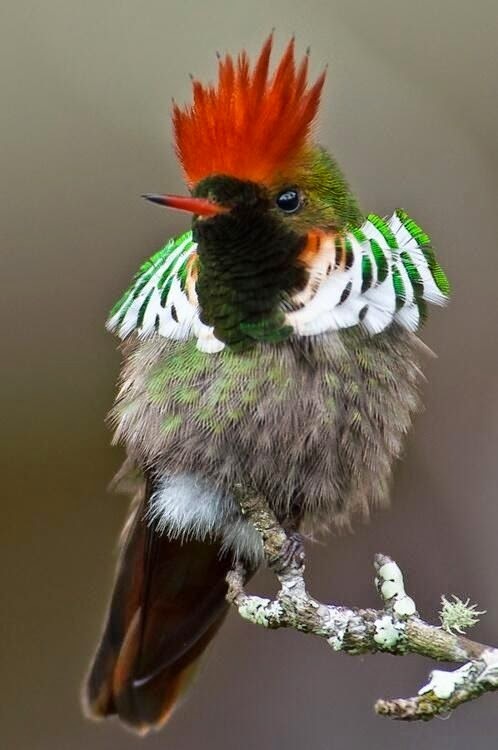 The tiny tufted coquette oftentimes mistaken for a large bee.